While gardening three days ago, sprained the middle joint of my middle finger. It HURT! At first, assumed the sudden pain was due to a cactus spine stuck in my gardening glove. But by early evening…as the pain increased, and the finger stiffened with swelling and bruising, I became concerned it was sprained or may somehow have been fractured? Symptoms may be felt on the front, back or sides of the affected finger joint. Pain and stiffness generally increase over the following 24 hours with swelling or bruising developing around the affected joint. It is also common for patients to experience pain when firmly touching the area, and, in some cases, there may be a feeling of weakness in the hand and fingers. Treatment of a finger sprain in the first 48 – 72 hours is vital to reduce bleeding, swelling and inflammation. The first evening ~ I soaked my hand in hot sea salt water until the water was only warm. Applied HELICHRYSUM & ImmuGOLD rubbed into my dry, but damp, skin before going to bed. The next morning ~ Swelling more localized to middle ‘puffy’ joint, rather than whole lower phalange. Applied HELICHRYSUM & GERMAN CHAMOMILE essential oils rubbed in. I was able to continue gardening the next day without any problems. 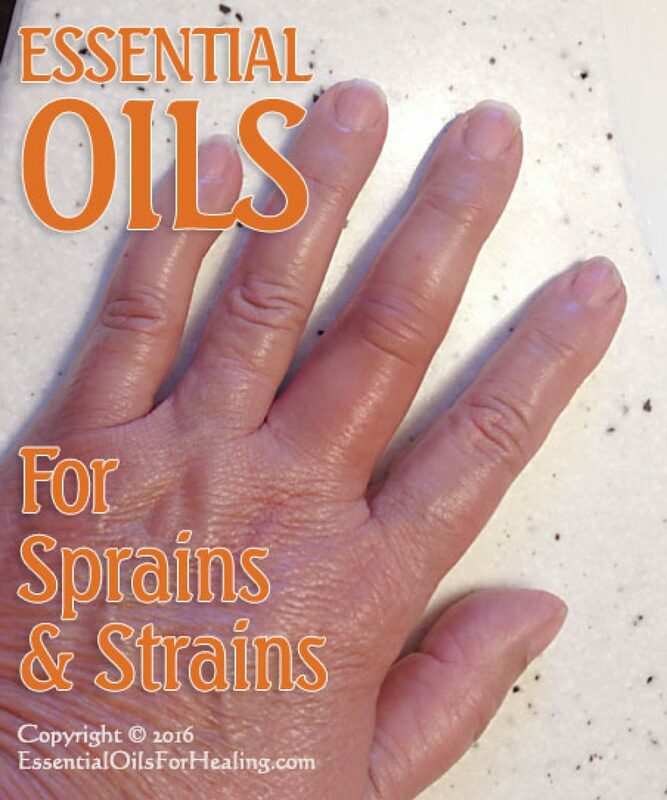 That evening ~ Applied CYPRESS & LAVENDER essential oils rubbed in to reduce bruising and edema. The second morning and evening ~ Puffiness was less. Bruising fading. Continued to apply CYPRESS & LAVENDER essential oils rubbed in. The third morning and evening ~ Swelling is GONE, except for point of injury. ZERO pain even w/pressure! Range of movement is almost completely normal. Applied CYPRESS & LAVENDER essential oils rubbed in. The fourth day after injury ~ I can bend my finger (clench my fist) completely without any sense of stiffness. (My ‘normal’ fingers on my other hand feel stiffer than the injured hand!) There’s a little lump on top of the joint where the injury happened. If pressed firmly, I notice a very subtle discomfort. I consider the injury healed. Will continue to use essential oils to reduce the lump until it’s gone. Immediately stop any activities that increase your pain. Splint your finger by taping it to an uninjured finger next to it — which is called “buddy wrapping” — or use a finger splint you find at a drugstore. Wrap your finger with an elastic bandage to reduce swelling. Protect your skin by putting some soft padding, such as felt or foam, between your fingers before you tape them together. Start taping at the tip of your finger, overlapping half the width of the bandage until you reach the base of your finger. Watch for skin color changes. If the tip of your finger is blue or gray, or it tingles, the bandage is too tight. CAUTIONS: Do not do ‘buddy-wrapping’ if you have diabetes or peripheral arterial disease. Never splint a finger in a completely straight position, such as on a Popsicle stick. For proper healing, the finger should be slightly bent and in a relaxed position. The injured finger may need to be buddy-taped for 2 to 4 weeks to heal. Apply ice to your finger for 15 to 20 minutes several times each day for the first 3 days after injury. Anti-inflammatory medication may ease discomfort and hasten the healing process by reducing pain and swelling associated with inflammation. When cleared by your doctor, gently start bending your finger, working toward a full fist. Early motion is important, as finger stiffness / weakness after ligament injury may become permanent if your finger is immobile for too long. 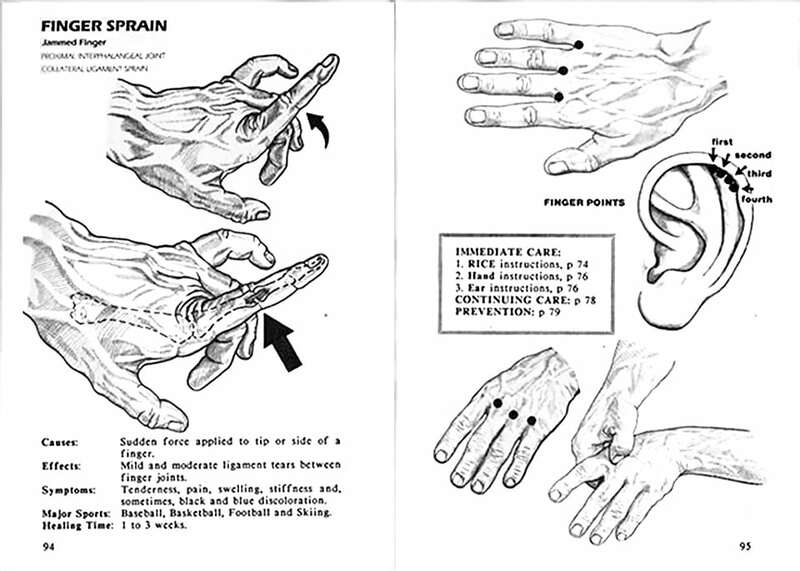 With minor to moderate finger sprains, a gradual return to normal activity / sports usually is within 2 – 6 weeks. More severe injuries will require a longer rehabilitation to gain optimum function.